Toward the end of 1957, Bradford Day published a cloth-bound first edition of Beyond Thirty and the Maneater. Previously, these two stories had been available in pamphlet form, with limited distribution. I obtained my copy from him in January of 1958. In 1956 Brad Day had published the Biblio of Edgar Rice Burroughs' writings that I mentioned in Chapter XVI. That was the first detailed Burroughs bibliography I had seen, and probably the first to contain detailed information on each title. In my opinion, Day's publication of Beyond Thirty and the Maneater was the start of the Burroughs boom that started in the 1960s. Here, for the first time in nine years, since Llana of Gathol, and the first time since the passing of the Master Storyteller, was a new hard-cover Burroughs book. Day published this book, of course, without the permission of Ralph Rothmund, who had been managing Edgar Rice Burroughs, Inc. for years, and had allowed many of the Burroughs titles to become public domain. He simply ignored the copyright renewals. He apparently believed that it was a waste of money to renew, since in the 1950s there was no longer any interest in Burroughs. Also, Rothmund might have thought that the only interest in the future would be in the Tarzan movies. This misjudgement would ultimately have a beneficial effect on Burroughs fans, and would be a somewhat mixed blessing for the Burroughs corporation. When Vernell Coriell visited me in October of 1957, he told me about Stanleigh Vinson and his great Burroughs collection. I wrote to Stan and set a date to visit him in April of 1958. I drove to Mansfield, Ohio on a Friday evening, checked into a motel and then went to Stan's home. I was astounded by the scope and depth of his collection. He had probably the finest and most complete collection of Burroughs material that I have ever seen. The original artwork alone was a joy to behold. Most of it was by J. Allen St. John, some of which Stan had commissioned St. John to do for him. Stan had three library rooms for his collection of several thousand books and magazines, plus comic books, comic strips, and movie material. He also had obtained 16-mm prints of most of the Tarzan films, plus films such as the Burroughs-Tarzan Enterprise pictures of Tundra and The Phantom of Santa Fe. I was most impressed. We visited and talked until late Friday, and all day Saturday and two-thirds of Sunday, before I had to tear myself away to journey back to Pittsburgh (without Interstate highways). Reproduced here is part of a Mansfield, Ohio newspaper article about Stan and his collection. Stan became one of my fondest friends, and he is now sadly missed by all of us who experienced his friendship. In August of 1958, I made a business trip to New York City and had time to travel out to South Ozone Park in Brooklyn to visit Bradford Day. I questioned him about his book publication of Beyond Thirty and the Maneater. He told me that he had researched the copyrights at the Library of Congress and found that they had lapsed. He wrote to Ralph Rothmund about publishing the stories, but received no reply from him, so decided to go ahead and publish the book. Millions of fiction readers are familiar with the name Edgar Rice Burroughs, author of the "Tarzan" books, but probably no one person has maintained a more avid interest in his writings than Mansfielder Stanleigh B. Vinson. At his home, 1060 West Cook Rd., he has created an "Edgar Rice Burroughs room" which is filled with all the author's first editions, and all but two reprints of his books; magazine stories, newspaper serials, movie posters and billboard advertisements, oil paintings of the author and book characters by the original illustrator of the Burroughs books, and five complete Tarzan films, including the first silent film, "Tarzan And the Apes," (sic) which starred Elmo Lincoln, and is a real collector's item. Like others, Vinson read many of the Tarzan books as a youth, but his interest centered chiefly on Burroughs' science-fiction stories. About 15 years ago his interest was revived when he met a Baptist minister in Kentucky who collects "Tarzan" books. Soon Vinson was contacting book dealers throughout the country for wanted editions, corresponding with "Tarzan" fans in all sections of the country, and was launched on a new and fascinating hobby. There followed a long period letter-writing between the Mansfielder and the famed author, until the latter's death in 1950. Vinson says there are three or four other large collections of Burroughs' writings, including those of the Kentucky minister, a circus performer from Illinois, who comes to Mansfield occasionally to see the Vinson collection; a salesman in Philadelphia, and an artist in Chillicothe. However, none has a collection as complete as the Mansfield man. My long adventurous journey with Tarzan continued in 1959. In March I went on a business trip to Minneapolis. 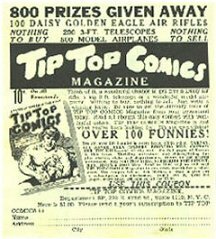 I had not heard from Waring Jones, of that city, for about 18 years, since we had corresponded following the article published about my Burroughs collection in Tip Top Comics in 1940. [See Chapter IV] I would try to find him in Minneapolis since I would be there for several weeks. Checking the telephone book, I found a listing for a Jones at the same address he had written from years before. Calling that number, I discovered that Waring still lived there with his mother. We set up a time for me to visit him and see his collection. He still maintained the collection he had built up in the 1930s and 1940s and had increased it over the years with many first editions, magazines, and foreign editions. Waring had a friend working at the Minneapolis Morning Tribune who thought I would be a good subject for an article in the newspaper. She interviewed me and the following article appeared on March 6. I think this was my first lesson to be wary of newspaper interviews. What appears in print is not always what is said at an interview, as I found out when this article appeared. This has happened to me several other times in later years. Two old pen pals met for the first time this week in Minneapolis. It was "Tarzan" who brought them together. C.B. Hyde, Pittsburgh, Pa., and Waring Jones, 1620 Mt. Curve Av., Minneapolis, began writing each other back in 1940. Jones wrote the first letter after reading an article in a comic magazine about Hyde's collection of Edgar Rice Burroughs novels. After several letters were exchanged, the correspondence stopped. HYDE, HOWEVER, continued collecting "Tarzana." Jones added to his Tarzan books until he had 52. Hyde saved the Jones letters. This week he made his first visit to Minneapolis on business for United States Steel Corp. He called Jones on arrival and the two plunged into talk of Tarzan. "Most people think of the movies and comic stripes when they thing of Tarzan stories," Hyde said. "Actually, the Burroughs novels often satirized civilization. Tarzan was well-educated. He didn't live in a tree-house but owned ranch in Kenya, near Nairobi. "IT'S TRUE that Burroughs had Tarzan reared by a tribe of apes, but they are fictional. These apes do not exist in fact." Hyde added that in the novels, Tarzan educated himself from books saved from the ships library, after a shipwreck. "He never would have said, 'Me, Tarzan, You, Jane', except in the movies," Hyde added. The Tarzan character of the novels married an American girl. The wedding took place in Wisconsin. Hyde currently owns 250 different editions of 58 titles by Burroughs. Most are Tarzan novels, but some are early science fiction books written by the author. Burroughs who died in 1950, also founded the town of Tarzana, Calif., Hyde said. But Burroughs didn't write the comic strip. Hyde has Tarzan comic strips in seven languages including Arabic as well as many of the novels in foreign translations. He has seen all of the Tarzan movies filmed since 1933 and picks Herman Brix (now known as actor Bruce Bennett) as his favorite Tarzan. ALTHOUGH HE never met Burroughs, Hyde has autographed copies of some of his books. He has met two of the movie Tarzans -- Lex Barker and Buster Crabbe. Hyde's collection was packed away when he went into World War II. When he returned, only one item was missing. "Once, when we were still in school, a friend of mine and I spent one whole day scraping a Tarzan movie poster off a 24-foot billboard. We put it up on the ceiling in our garage. "When I came home from service, I discovered my father had done away with it," said Hyde. HYDE MARRIED a girl named Alice -- and Alice was the name of Tarzan's mother. Their son is named John Clayton -- Tarzan's real name. Hyde believes his collection may be one of the most complete in the world. It has been displayed at the Mellon National bank in Pittsburgh. Currently, he's saving toward an African safari. "I guess I always have wanted to take a look at the Tarzan country," he said. When his son is old enough, Hyde expects him to begin reading about Tarzan. "I'd much rather have my son grow up reading Tarzan than look at some of these TV programs," Hyde said. I had to return to Minneapolis a few more times that year, and also in 1960, so Waring and I had more visits together. Later in 1959 he came to Pittsburgh and stayed for several days with us, and so was able to see my collection. Other events were about to happen that would have a profound effect on my life and my hobby. The Pittsburgh Science-Fiction Society decided to bid for election as the host committee for the 1960 World Science Fiction Convention. At that time the convention site was voted on and selected only one year prior to the Convention. The 17th (1959) World Con was to be held in Detroit on September 5, 6, and 7. As a member of the Pittsburgh group, I was appointed to participate in the bidding campaign. Bidding against us for the 18th World Con site were science-fiction clubs from Washington, D. C. and Philadelphia, Pa., both of which had already started their campaign with advertisements in convention progress reports and in fanzines. More about this exciting event in the next chapter. In 1959 the 17th World Science Fiction Convention was held in Detroit, Michigan over the Labor Day weekend. Since I was a member of the Pittsburgh Science Fiction Society, which was bidding to hold the 18th World Con in Pittsburgh, the Detroit committee asked me to present a Burroughs program. Vernell Coriell encouraged me to try something that might attract more Burroughs fans. Since this was aimed at a science-fiction-fan audience, I gave a talk on Burroughs' magazine stories. I noted that his first published story, Under the Moons of Mars (which appeared in The All Story Magazine from February 1912 to July 1912) and the last magazine story to see print before his death in 1950, Skeleton-Men of Jupiter (in Amazing Stories for February 1943) both featured the exploits of the immortal Warlord of Mars, John Carter. I also commented on other Burroughs stories with science-fiction elements, such as The Moon Maid and The Land That Time Forgot. The audience was a small group that got up early enough on Sunday to listen to me and to see some items I had brought along to discuss during my talk; for example, the magazines containing the stories mentioned. After my speech, I answered questions for half an hour. On Monday, the Pittsburgh Society won the right to hold the 18th World Con on Labor Day Weekend in 1960. However, I doubt that my talk made the slightest impact on the voting. Vern Coriell had been publishing The Burroughs Bulletin since 1947, and for the past 12 years had talked with many of his friends about forming a club for Burroughs fans. When Vern was in California in 1949, he obtained permission from ERB, Inc. to form such a club and to call it "The Burroughs Bibliophiles." However, it was to have no official connection with ERB, Inc. The club was still in the discussion stage when I first met Vern at my home in 1957. After Pittsburgh was selected for the 1960 World Con, Vern and I decided to get the club finally on a firm footing. Since I was a member of the Pittsburgh Convention Committee, Vern asked me to set up an organizational meeting for him at the Convention. We assumed that a large group of ERB fans would be there; he knew from the numerous requests for copies of The Burroughs Bulletin that many were also science-fiction fans. But, a few weeks before the 1960 convention, he asked me to conduct the organizational meeting in his place, because commitments to his job would prevent him from attending. We had already published notices of the meeting in the "Convention Progress Reports" as well as the Convention Program Book. The meeting was set for Monday, September 5, 1960 at 11:00 A.M.
About thirty ERB fans attended that meeting, and the club indeed did get organized. The meeting lasted for almost two hours and was sparked with lively discussions. The first subject discussed was the name of the club. According to Vern's wishes the group unanimously chose "The Burroughs Bibliophiles." The second topic was the club's purpose. After some lengthy arguments, we decided that the purpose should be "to promote the good name of Edgar Rice Burroughs, and the many characters he had created, and to attract new fans and readers of his works, and to assist collectors in the pursuit of the hobby." We established elected offices and voted for officers. Dues were decided on, and the title of "Dum-Dum" was voted to be used for the club's annual meetings. It was Allan Howard who suggested the name "Dum-Dum": as he put it, "When the bulls get together and howl!" The official club publications would be The Burroughs Bulletin and The Gridley Wave. The next Dum-Dum was scheduled for the Mid-West Science-Fiction Convention in June 1961 at Cincinnati, Ohio. My election as President at that organizational meeting was a total surprise to me, and it was an overwhelming honor to help Vern keep the club going through the many years it flourished. Although the organization faltered after Vern's death, George McWhorter has returned The Burroughs Bulletin and the Dum-Dums to a regular schedule. Indications are that his efforts will keep the Burroughs Bibliophiles a lively organization for many more years. I count that organizational meeting as the first Dum-Dum, since indeed we bulls did gather and howl about coming together as an organized club. By 1960 I had completed the construction of my library room, except for ceiling panels. On Monday afternoon about ten of the new Burroughs bibliophiles members came out to see my collection. It then consisted of about 300 books. The item that caused the most comments was a 1936 Wheaties cereal box, featuring a picture of Johnny Weissmuller as Tarzan in Tarzan Escapes. No one had seen this "do-dad" before, nor do I know anyone today who has that item in his collection.